FSC certified maple ply, low VOC finish, back painted glass inset top, solid FSC maple dovetailed drawers, polished stainless steel, Padauk and Narra inlays. The constellation of Orion and the star Sirius figures prominently in the belief systems of the Dogon tribe of Africa and the mysterious Hopi tribe of the American South-West. In addition to architectural similarities between these peoples (i.e. the construction of dwellings on the sides of cliffs) the Dogon and Hopi also share traditions suggesting ancient connections to the pyramid builders of Egypt and the Mayan Peninsula respectively. It was the contemplation of these and other unusual parallels between these two peoples which laid the foundation for the design of this credenza. The 3 stars of Orion's belt inspired the configuration of doors, which are each raised pyramids in design. Behind the center door is a bank of 4 drawers, each of which opens by way of a pneumatic touch latch motorized mechanism. A single adjustable shelf is located behind each of the outer doors. The top is an inset of back painted glass. The back is fully finished, and inlaid with a raised relief. The convex inlay representing Sirius is made of a wood called Narra. The particular selection of wood used to make this inlay carries a special provenance in the world of sustainable forest management, in that this actual inlay comes from the last remaining board known to exist of the very first wood to be sustainably harvested on the Solomon islands in the early to mid 1990s. This wood made its way into North America by way of Eco-Timber in California. 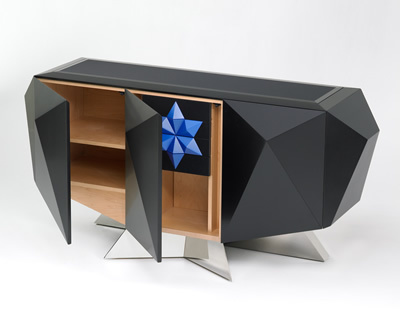 This credenza been made as an edition of 1 of 1, and will not be duplicated. It is individually numbered and signed.